How does your sales pipeline look right now? If we went and took a look at your company’s forecasts at this very moment, would your projections hold up? Sure, new opportunities may be appearing and working their way down your funnel like clockwork, but then again, maybe your leads have been growing a little more stagnant over the last month or two. You may have even noticed some of your long-standing, loyal customers switching to your competition. It may not seem like much now, after all, almost every sales leader will experience a month or two of downturn at some point . . . but what if this time it’s different? What if something deeper is at play? Fortunately, there are a number of ways to build or improve your pipeline that don’t rely on crossing your fingers or trusting wildly optimistic forecasts. Oftentimes bringing in an outsourcing partner to develop a sales program is a quick solution that helps you pinpoint and understand exactly what’s creating the current sales downturn. Our clients are frequently facing overt challenges such as changing regulatory pressures, increasing competitive pressure, or a lack of market enthusiasm because the product’s life cycle has run its course, but there are almost always also covert challenges hiding right below the surface. Overt challenges are usually spotted quickly and can be tackled head on, but the covert challenges are often overlooked and end up slowly chipping away at the company’s pipeline until a leak forms. As more covert issues begin piling up, the leak grows, and the sales leader is stuck trying to discern where the actual issue lies. An outsourcing sales partner will come ready with a well-oiled sales process that can flesh out any disruption in your current pipeline, improve your ROI, be scaled up or down depending on your company’s budget, and become completely turnkey. Beyond that, a good outsourcing sales partner will be using a proven process that can either create or completely re-invent your pipeline while allowing you to re-focus your efforts toward building your business and/or future products or services. Below is a peak into our sales process, a look at what we do during each of its stages, and detail into how it prevents pipeline leakage before it starts. The Analyze stage helps us leverage your company’s predictive analytics, historical sales data and business objectives to build an accurate sales plan, complete market assessment and compensation structures. This is the first, and oftentimes most critical stage in the process. It has been refined over the past 20 years and continues to improve as new technology makes its way to the field. The Target stage allows us to pinpoint your company’s specific selling territories that are most likely to achieve the greatest value the quickest. 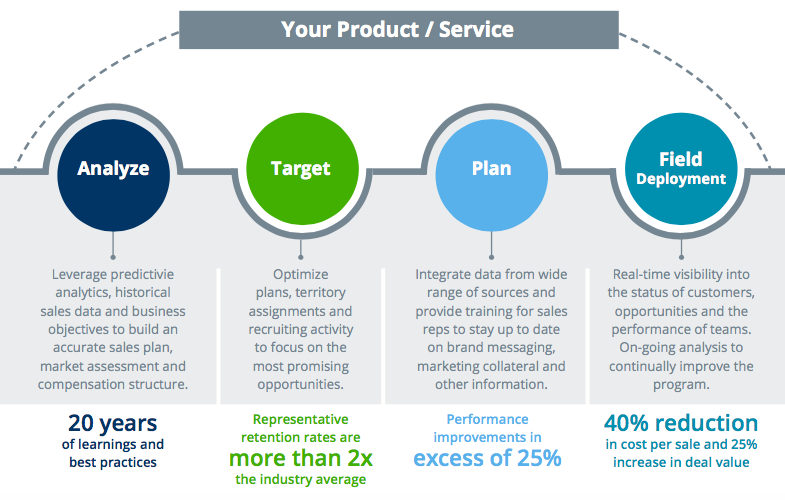 At this stage, we optimize your selling plans, territory assignments, and recruiting activities to focus on your company’s most promising opportunities. During the Plan stage, data is integrated from a wide range of sources and training is provided to the sales agents that will be representing your brand. Your territories come to life in our proprietary mapping system and the field sales representatives begin to familiarize theirselves with your prospective clients. This way, everyone is up-to-date and fully trained on your brand’s messaging, marketing collateral, and/or any other important information that may be necessary. Finally, we begin our Field Deployment stage, often within 30 days of signing a contract. As a business partner, you will start gaining real-time visibility into the status of your customers, your opportunities, and the performance of each team member in the field. As data begins being collected, ongoing analyses are set to continually adjust and improve the program specifically toward your business. Sales Partnerships integrates precision-based outsourced sales to quickly launch products, increase results from dormant or lagging accounts, increase activation and reduce churn. Every enterprise has opportunities they are capturing, and we can help you find the best ROI opportunities while capturing them for you. An outsourced sales team like ours can increase return on investment, guarantee better speed-to-market, and free your company to concentrate on building your business and products. You focus on your core competencies, we focus on driving sales for you.